I learned a new word this week*: tsundoku, a Japanese word meaning owning too many books that will never be read. I came across the word in the Saturday paper, in an article on home decorating that had me in stitches for its suggestions on ways to display a literary collection. The first picture showed two small shelves hung on a wall, each with a stack of three or four books, plus plants and pottery. The second picture had a small table with three books on it. I showed this to my husband just so I could laugh at his dumbfounded expression. The next page did show one photo of a room with something approaching a book collection—a wall with built-in bookcases—but this set me off again; the books were arranged by colour. (How could you ever find what the book you wanted?) I have since discovered it is possible to buy books by the foot, sorted by subject, physical style, or colour. Buying mysteries by the foot doesn’t sound too bad, but the other two… And finally, there was the suggestion of shelving the books with their spines against the wall to make them less conspicuous. I hardly know whether to laugh or cry. Let’s laugh; after the horrors in the news the last few weeks, I could use a good giggle. The rest of our bookcases are equally overloaded. We’ll never win points for our decorating style, but we don’t care. Our books comfort us; they make our house our home. 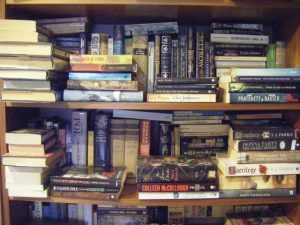 So you think we suffer from tsundoku, don’t you? I prefer to think our affliction is lack of shelf space, rather than too many books. I’m not sure how well tsundoku translates into English, either. Does it mean a compulsive need to collect more books than you can possibly read in one lifetime? Or does it apply when you have more books than you can read in the limited, near future (a year or two, say)? On the flip side, given that bibliophiles are going to own books, what’s the point of having shelves full of books we’ve already read? I need to have enough unread books on my shelves that when I’m done with the day’s work—too late to go to the library or bookstore—I can easily find something that fits the mood I’m in, whether that’s fantasy, mystery, history, romance, or whatever. That’s not to say I advocate tossing every book when finished. There are reasons for keeping around some friends, both old and new. Some books we reread to recapture the emotional experience it induced, others work on so many levels each revisit brings out something new. But my problem—bigger than the one of piling up books I haven’t gotten to yet—is keeping around too many I have read and will never read again. I’m getting better at pruning, but it’s still difficult, especially when my dear other half is a worse hoarder than I am. Take that copy of The Pillars of the Earth: do I push it on the rest of the family and insist they read it? No. Will I ever want to read it again? Unlikely, and I’ve already held onto it too long. It’s going in the box by the back door to be given to a neighbour or donated to a used book sale in hopes it will find a better, more appreciative home, or at least a chance to be read again. The World According to Garp? Same treatment—out! And if there are still unread books on my shelves when I die, is that so bad? It doesn’t seem nearly as awful as either running out of books, or losing the enthusiasm to open a new one.